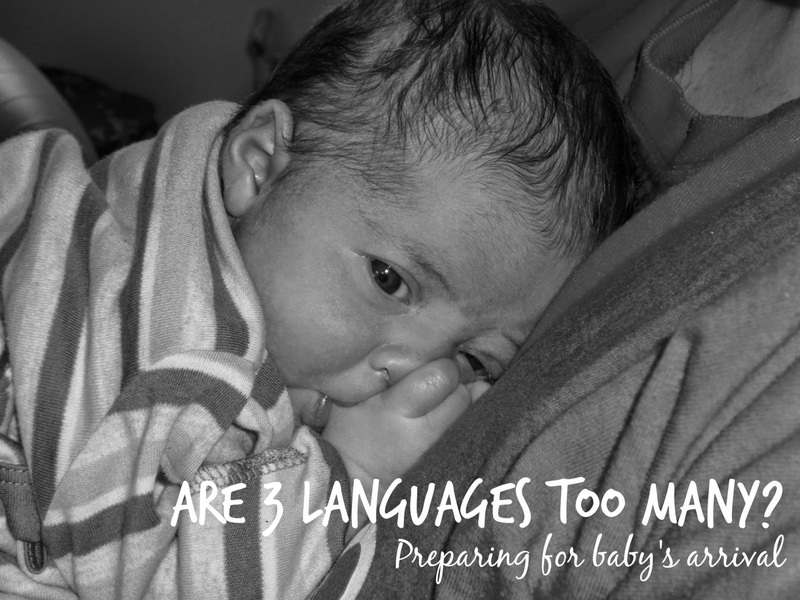 People often ask if there is anything one can do to prepare for a bilingual baby coming into a household. I am sure that if you search the web, you will find some very useful lists of things you could do. I am not going to write one here. I will instead tell you about the challenges I encountered before our first was born and how I prepared (or failed to prepare) our own family. If you are looking for lists of this to do, buy, plan. I am sure you will find some excellent ones. I shall mention two here. Rita over at Multilingual Parenting, for example, suggests speaking to the baby as much as possible, stocking up on resources and discussing with your partner what to expect and what strategies to use. This seems like very sensible advice. Esther's advice over on Third Culture Mama is also excellent with some great book recommendations (I must have read the exact same ones). And, of course, you have to watch the videos of her cuties. There are plenty more pieces with excellent lists of things to plan out there. As far as we were concerned, here is what we did and did not do. I hope this helps you out on your journey. There was never any doubt that LJ was going to be a multilingual baby. Friends and family would have been surprised if she had not been and to be honest, what language would we have chosen to speak to her if we had decided to raise her monolingually? She was born in England to a French mother and a Portuguese father. I was a researcher and teacher in linguistics and language acquisition. I would have made a bad name for myself had I decided to raise her in English only. So, in mind, there was never any doubt I would speak French, P would speak Portuguese and she would learn English as the community language. We would have a trilingual baby. P took some convincing though. You see, I wrote a thesis about bilingual children being raised learning French and English from birth. So, I had surrounded him with stories of bilingualism being a great thing from birth and success with two languages. He was unprepared for 3. To me, 3 languages were no different. It would simply mean we would have to work harder at the non-community languages. He asked me to show him that 3 languages were NOT too many (he wanted science). The problem was that there was (and there still is) very little about acquiring more than two languages from birth. The studies that existed tended to be rather descriptive, odd cases here and there and there was no real scientific evidence proving learning three languages from birth was just as easy as two. I gave him a book (B. Pearson's Raising a Bilingual Child ) which had a few mentions of cases with multilingual children. But overall, he had to take my word for it. He went along with it because I highlighted the fact that our baby would, otherwise, not understand his grandparents. Yet, I am sure deep down he still feels that Portuguese is a lesser-status language and is happy if both our children speak the other two. He had also become so native-like in English as we had no contacts with any other Portuguese speakers, that he struggled to think of the words to use (a serious case of language attrition after 14 years in the U.K.). I remain convinced that, to this day, the fact that he speaks French instead of Portuguese on many occasions to our children can be linked to these issues. This is, and will be, an on-going issue, for me. I am working on it! This is something I wish I had done more of before the children were born. Of course, we spoke to them about how this was going to work out, who would speak what, etc. But because they do not live near us, they would not really be involved in the day-to-day issues and would not really see how it would work. I wish I had spent more time highlighting to them how important it is for them to help us support the minority languages. Bringing up children who, in effect, now have 3 minority languages takes a lot of thinking and is a careful balancing act. Even from afar, they can help us achieve that by, for example, buying the children some books, music, cartoons in those languages; by chatting over Skype or Face Time regularly and engage them as much as possible. We are constantly trying to find temporary fixes for this and it is really not ideal. We had to explain several time to my mother-in-law that even though she speaks French, we would rather she did not switch to French with them. It is difficult and it is something that is much easier if you set out goals and what you expect to happen language-wise before baby comes. Finally, my last piece of advice is about picking a nursery or other day care facility. When I went back to work, in the U.K., one of my first question to the nursery we really liked was: "how do you feel about multilingual children?" It may have been a great place but if they had felt awkward or if I had not liked their answer to the question, this would have been a deal-breaker for me. I was relieved when they mentioned they had lots of other multilingual babies and were aware of the issues and challenges the children may face. When we moved to Germany, I, again, put that question at the forefront of my search for a kindergarten. 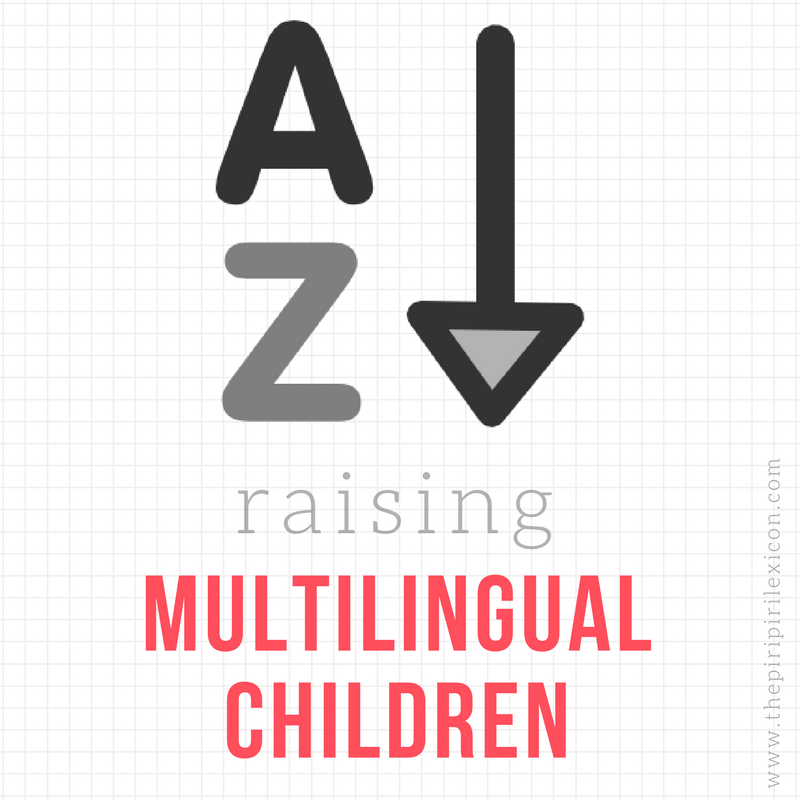 To sum it up, make sure you set out what you expect out of raising your children multilingually with whoever is closest to you on a daily basis and those who can help support you (even from afar). Reading the literature may help you set out those objectives but make sure everyone knows their role. You might like to try these books which have since been published. I have not read any of them yet. Annabelle, thanks for the shout-out! I truly loved reading a bit more about your own story and how your academic research has influenced your parenting choice. Random side note - my thesis (written in German!) was on Intersentential code-switching in IRC / chatroom samples (remember chats?) and whether or not written code-switching follows grammatical patterns, conjugation, agreements of the majority or minority language. Language geeks unite! :-) Jokes aside, it was the research that led me to the joys of bilingual parenting myself.